Sleep apnea is a condition that affects the way you breathe while sleeping – often leading to frequent, loud snoring. Specifically, this is instigated when the soft tissue in the back of your throat relaxes while you sleep, causing interruptions in breathing. These interruptions usually last between 10 to 20 seconds each and can occur up to hundreds of times a night. Sleep apnea is typically more prevalent in males, smokers and the elderly; it can also cause a wide range of problems from sleep disturbance to more serious health issues. However, with advances in dental devices, this condition can now be treated and controlled. 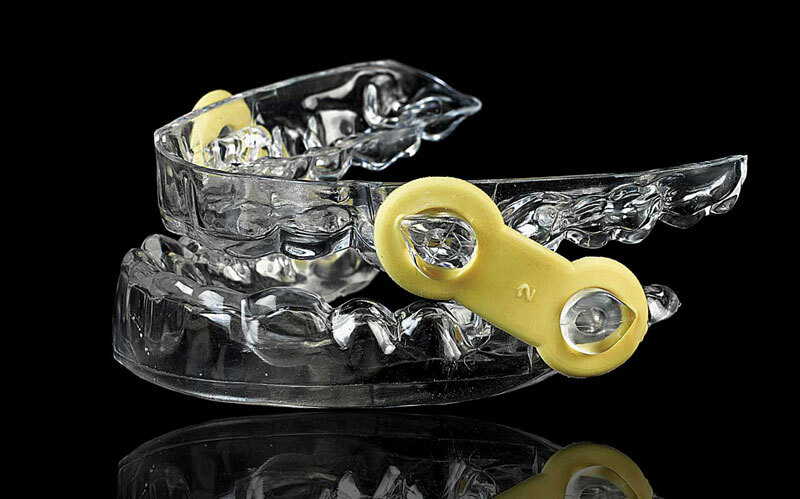 A snore guard is a custom-fit plastic or acrylic mouthpiece similar to a sports mouth guard or orthodontic retainer. It keeps the upper and lower jaw in place when the throat relaxes during sleep. This allows the air passage to remain open, which may provide deep, relaxing sleep. Oral appliances are comfortable and easy to wear. Most people find that it takes only a couple of weeks to become acclimated to wearing the appliance. Treatment with oral appliances is noninvasive. Custom-made oral appliances are proven to be more effective than over-the-counter devices, which are not recommended as a therapeutic option. The types of appliances shown above are an effective, comfortable treatment solution for patients experiencing snoring and sleep apnea. Using these devices, your jaw is held in a forward position so it does not fall open and cause your airway to collapse. This reduces snoring and enhances breathing. These devices are adjustable, convenient for travel and may effectively treat sleep apnea without using medication, an uncomfortable mask or surgery. How do I get one made? First, call our office to schedule a consultation. If your appliance is for snoring, we can take impressions of your teeth to make the appliance immediately. If your appliance is for sleep apnea, you will require a medical diagnosis by a sleep doctor who conducts a sleep study, as there may be health consequences for those who suffer from moderate to severe or even mild sleep apnea. 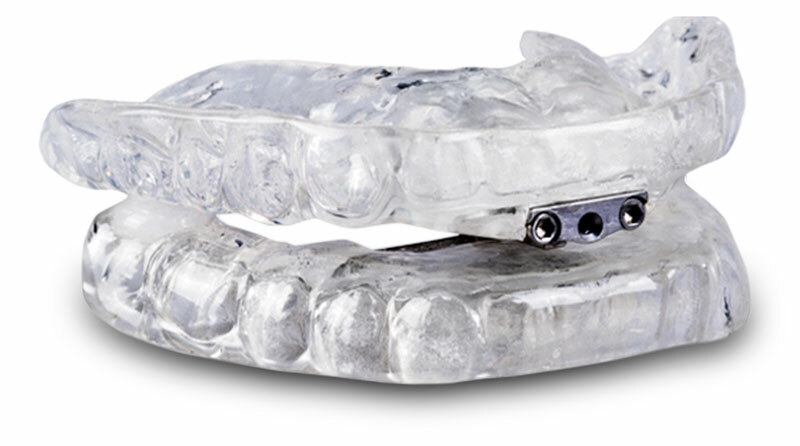 If your obstructive sleep apnea is mild enough to be treated by a custom-made oral appliance, your sleep doctor will prescribe the appliance, and our office will make the device for you. 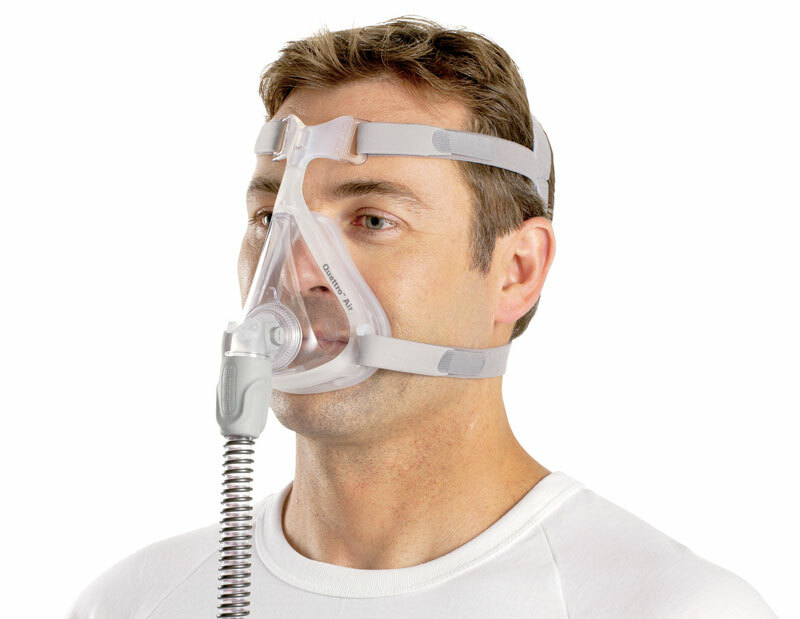 If the sleep doctor determines that your level of sleep apnea is moderate or severe or determines that an oral appliance will not treat your condition, they may recommend a CPAP machine and mask that is worn at night to relieve symptoms. Sometimes in mild cases the sleep doctor recommends either the CPAP or the oral appliance—in which case you may wish to try the oral appliance first. 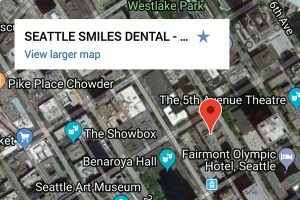 Dr. Jenny Nguyen is trained in oral appliance therapy and is familiar with various designs and can recommend an approach that is best suited for your specific needs. For more information on sleep apnea, chronic snoring and oral appliance therapy, please call our office to schedule a consultation.